Context: Located on the highest point in Athens, Greece, the Acropolis was first constructed as a fortress/governmental palace for the king or Anax around 1000 BCE. However, after the Athenian defeat of the Persian army, the city embarked on a new Classical Era and began to rebuilt the site. The version we now know dates from 450 BCE, which is sometimes referred to as the "Golden Age of Perikles", the Athenian leader at the time. 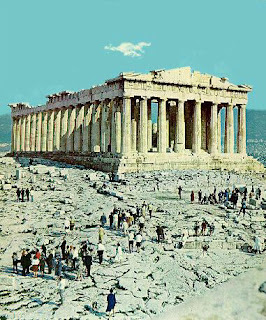 There are many acropolai (the plural for Acropolis) in Greece; however, the one in Athens is the most famous in existence. 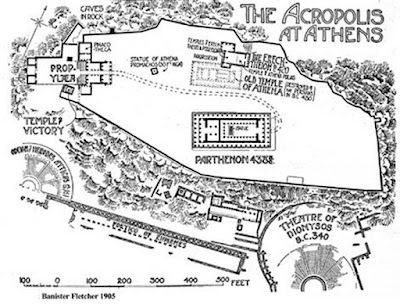 This next section will be in the order of the procession in which the Athenian celebration would have encountered the buildings of the Acropolis. The term Panathenaic literally means "all of Athens." "Pan"- Means "all" and is also associated with the god of all the woods, "athenaic" - Athenian. Although the Acropolis was home to a polytheistic (many gods) culture, the majority of the complex was devoted to Athena, the goddess of wisdom and the main goddess of the city. 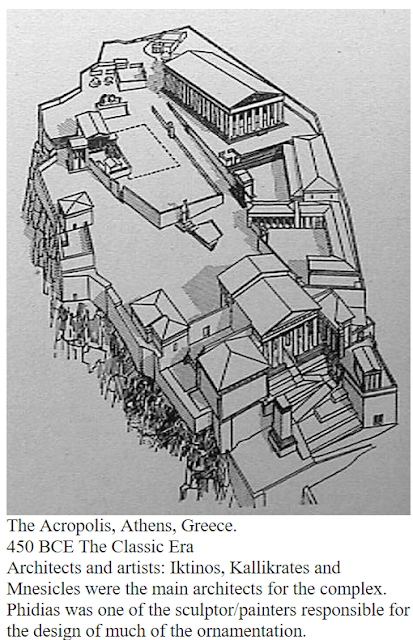 Below is the basic plan of the Acropolis, its buildings and the two theaters at its base. Along the perimeter of the hill on which it is perched is a pathway, marked in gray. On certain festival days, every four years, the entire town of Athens came out and took the long route around the Acropolis to its top which is known as the "Panathenaic Procession." 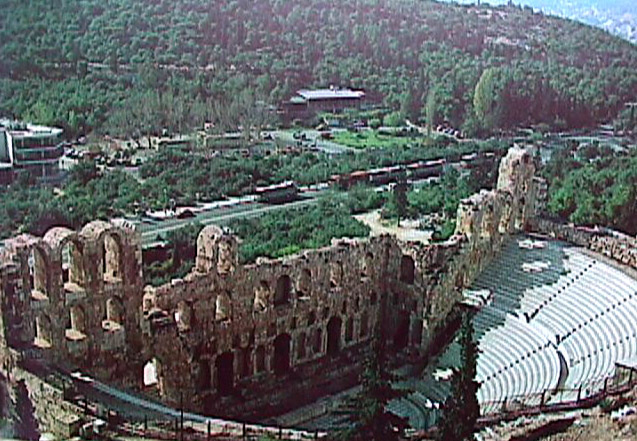 This procession would begin in Athens's Agora take the Panathenaic way and pass by the Herodean Theater continuing on past the Theater of Dionysus all the way around the base of the hill and finally ending with entry into the Propylaia, also known as the Pinakotheke. By moving all the way around the hill instead of just walking up, each Athenian could understand the magnificence of this sacred high point. The journey would end at the Parthenon where the Athenians who had made the trek would leave their offering to the goddess Athena. Form: These Athenian theaters follow the same design as the theater at Epidauros (see Marylin Stokstad "Art History" 5-72). The design is a symmetrical hemisphere (half circle) that is arranged similarly to modern day stadiums and can seat nearly 12,000 people. The stone material and the shape of the theater allowed the sound of the actors, who stood in the orchestra, to be heard throughout the theater. The actors entered onto the orchestra from the parados (wings). Behind them was usually a static building that was the backdrop called the skene. This backdrop had no ornamentation or painting and was fairly simple. In fact, props were kept to a minimum on the stage. Iconography: The theater itself was an important place for Athenians to gather and although it was probably not designed to be a symbol of civic pride, it developed a similar meaning to our stadiums and theaters within our own towns. One modern example would be Oakland's "Coliseum." 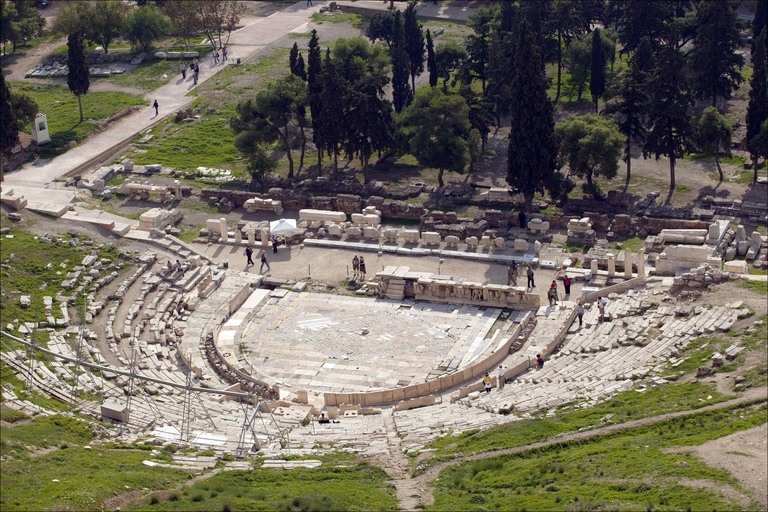 Form: The physical form of the Greek theater strongly influenced the manner in which the plays were written and performed. The actual components of a Greek play echo the physical form and symmetry of the theater itself. Components of Greek tragedy and the structure of the Greek tragedy This is the order of a play's performance, how each one of the acts is structured and what it contains. 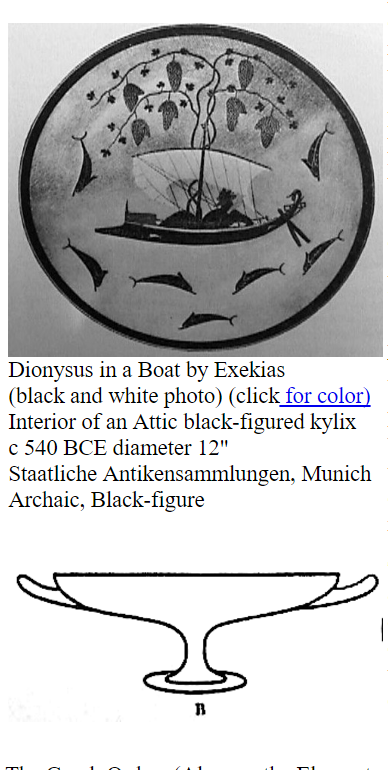 Form: The interior of this symmetrical, yet balanced kylix (wine cup) was decorated in black-figure style with the figure of the Greek god Dionysus in a boat. Out of the deck of the boat springs a grape vine and surrounding the ship are several dolphins or porpoises. 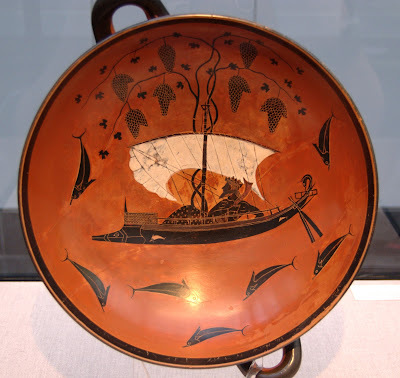 The figures are painted with a slit watered-down clay over the red, therefore creating that black-figure style The ground of the vessel is the natural red of the clay and the sail is heightened with white glaze. The scraffito technique is used as a means to bring out the details with an etching tool. 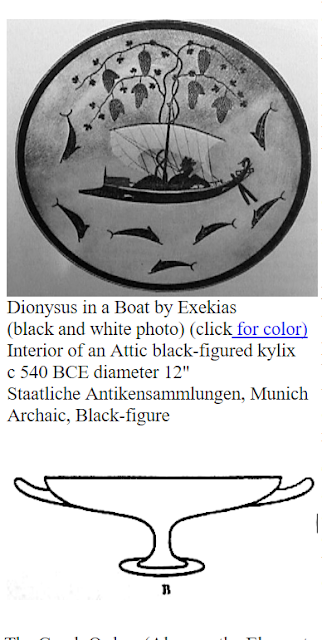 Iconography: It makes perfect sense that a wine vessel would be decorated with an image of the Greek god of wine, theater and ecstatic liberation, Dionysus. (The Romans called him Bacchus.) The grape vine represents his role as the god of wine and the dolphins are probably transformed sailors who committed an act of hubris against the god in one of the myths that precede the story told by the Greek tragic play The Bacchae (also called the Bacchic women). The "lucky" number of seven figures into the symbolism with seven dolphins and seven bunches of grapes. Context: Origin of Dionysus. (See Mencher "Liaisons" 49-86 (Ovid "Semele"). Dionysus's mother Semele, the daughter of King Cadmus of Thebes, had an affair with Zeus (called Jove by the Romans) who disguised himself as a shepherd boy. Unfortunately, her family does not believe she is carrying Zeus' child. 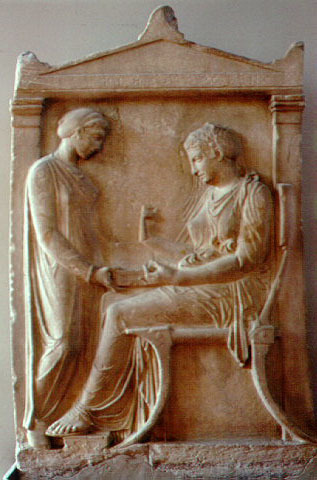 Hera, Zeus' wife finds out about the affair and goes down to earth disguised as a nurse maid to comfort Semele. Hera, angry at her husband and jealous of the young maiden, tells Semele to make Zeus promise that the next time he appears to her it would be in all his glory (robes, thunder, etc.). When Zeus keeps his promise, his powerful presence burns the young woman to ashes and all that remains is Dionysus. Zeus picks him up and inserts him into his thigh where he is reborn. Hera finds out about Zeus' devotion to his new son and chops Dionysus into pieces. Zeus then swallows him and he is reborn a third time. Iconography and Context: I was taught to look at the orders in a rather chauvinistic manner which is probably how the Greeks saw them as well. The Doric order is the most dignified and masculine of the orders and was named after the Dorian region. Iconography and Context: I was taught to look at the orders in a rather chauvinistic manner which is probably how the Greeks saw them. The Ionic order is a bit more feminine in its design because of the soft volutes of its capital. It is a rather problematic column because it does not turn corners well as you can see from this detail of the Nike Temple corner. It was named after the Greek region of Ionia. Form: The Corinthian is as complex as the Ionic but a bit overdressed. It has a base, simple fluting up the shaft of the columns and has an ornamented capital that makes it look like a salad basket with its acanthus leaves. The entablature is divided in two sections consisting of the unornamented architrave, and the frieze which is sometimes decorated with relief sculptures. Iconography and Context: I was taught to look at the orders in a rather chauvinistic manner which is probably how the Greeks saw them. But, in a more 20th century context, the Corinthian order is the Carmen Miranda or "drag queen" of the orders with its overly ornate basket on its head. It was named after the region of Corinth, conquered by the Greeks. Form: The Nike Temple is a small (27'x9') ionic order temple. The temple is amphiprostyle with four columns on both the east and west facades. There is little space between columns because of stone's lack of tensile strength (flexibility). There is a continuous running frieze in the entablature. 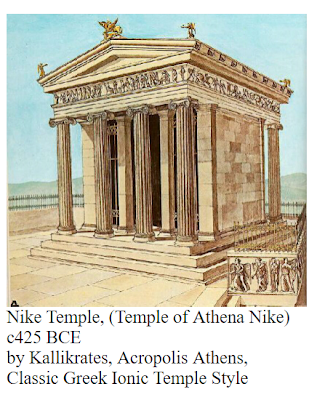 The Nike Temple faces in one direction (west), but appears to have two entrances with blank side walls. Surrounding the temple is a low wall called a parapet which contained low flat relief sculptures. On the parapet's(3) side is a bass relief carving(4) (a statue) of Winged Victory, or Nike. Iconography: The goddess Nike is a winged female figure that represents victory. The fact that this temple is located at the very entrance of the Acropolis could mean that victory is at the forefront of Athenian ideology. Form: This high relief carving is just one of many of the same type of winged figures in different poses. In this sculpture the winged figure of Nike is adjusting her sandal. Unfortunately most of the head and the wings sprouting out of her back have been destroyed but the torso and legs are well preserved. The anatomy and carving of the figure is very naturalistically rendered; yet it struggles to maintain a certain idealized figure. In other words, her figure adheres to the natural parts of a human body, but it also tends to preserve certain features as ideal. This mixture of natural and ideal is heightened by the drapery that clings to her body. The style of sculpting drapery, as if it were wet, is called the wet drapery style. Iconography: Winged figures in Greek art are personifications of victory. These nike figures are placed about the pediment of the Nike temple in different attitudes or poses as if they are part of a parade in celebration of Athens' victory during the Persian Wars. The idealization of the female form here is probably an illustration of the concept of kalos. 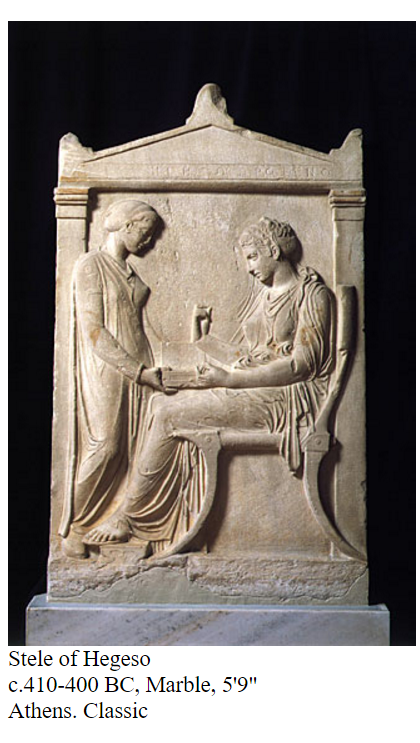 Form: This stele is rendered in style very similar to the Nike parapet. The two female figures are rendered in profile right against the front of the picture plane. The figures inhabit what looks to be a post and lintel temple which gives the viewer the sense of an environment. Each woman is idealized physically through the use of wet drapery. The folds of each dress accent the protruding knees and fluid bodies. The anatomy of their faces is naturalistic with some idealized features as well. An example of this is the bridge of the noses is representing as a straight line, a minor distortion of how noses fit in with the geography of the face: the bridge is usually slightly curved at the top. This aquiline feature is referred to as the Greek nose. Form: This stele is rendered in style very similar to the "Stele of Hegeso." The two female figures are rendered in profile view up close against the front of the picture plane. Each is idealized physically and wearing wet drapery. The anatomy of their faces is naturalistic but idealized as well: the bridge of their noses is a straight line which is a slight distortion of how noses fit in with the geography of the face. This aquiline feature is referred to as the Greek nose. The white-ground technique is a vase painting technique in which the pot was first covered with a slip of very fine white clay, over which black glaze was used to outline figures, and diluted brown, purple, red, and white were used to color them.